Omar Hazek has found himself at the centre of Egypt's battles for free speech - from prison. This month, Omar Hazek will see his second novel published. Under other circumstances, Hazek's short novel, set in the afterlife, would likely go unnoticed outside Egypt's narrow literary circles. Yet this novel has captured attention - not because of its unusual setting, but because it was written inside Alexandria's Borg al-Arab and al-Hadara prisons. That's where, for the last six months, the young Alexandrian writer has found himself at the centre of Egypt's battles for free speech and the right to assembly. 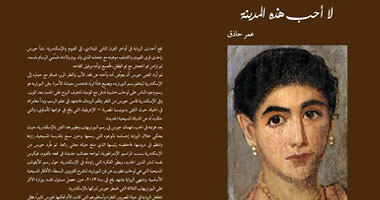 Way back in 2009, Hazek was a poet and librarian at the gigantic Bibliotheca Alexandrina. He published his first collection of poems, I Believe the Winter's Sun, and, in May of that year, he travelled to San Giovanni, Italy with the encouragement of his employer. There, he attended the "Love, Justice, and Peace in the World" poetry festival and was given an award for his verse. Then, in the summer of 2010, life began to change. That's when Alexandria native Khaled Saeed died in police custody and photos of his mangled face circulated around Egypt. This led to a movement, which helped organise the street protests of January and February of 2011. But, despite the movement's short-term gains, in the fall of 2013, Saeed's family was still looking for justice. Hazek could not leave this fight unsupported. Although the government had recently passed a law restricting public protest, the author joined others outside the Alexandria Criminal Court in late November. That's where the officers accused of killing Saeed were getting their retrial. According to one of Hazek's open letters from prison, a few days later, on December 2, 2013, his first novel was almost ready. Indeed, he had a 5 pm phone appointment with the owner of a print shop to discuss a few final details. But he was unable to make that appointment, as he was arrested just after 10 am. The arrest was perhaps some time in coming. The library's Independent Workers' Union said, in a recent public statement, that "it's not too far-fetched" to believe that Hazek's imprisonment is related to his outspoken attitude about corruption charges against Ismail Serageldin, who has been the library's director since its opening in 2002. Hazek himself said, in an open letter written from prison, that he understood that his political stands could have consequences, "one of which [might be] losing my job in Bibliotheca Alexandrina for criticising its head". Listening Post - Egypt's media: Marching in step? Indeed, Hazek was officially fired from the library near the end of April, sparking a new round of public protest. But his arrest and subsequent imprisonment were consequences that Hazek never expected. For expressing their beliefs outside the Alexandria Criminal Court, Hazek and six others were sentenced to two years in prison and a $7,000 fine. Hazek said in an open letter that he "expected nothing like prison - it is the highest price I have paid, and I don't know how I can solely bear the consequences of my own actions." Two months after his ordeal began, Hazek finally got a copy of his debut novel, I Do Not Love This City. In a moving letter he wrote for the book's launch ceremony, he said that, when his lawyer brought the book to his cell, "The first thing I did was to hide it from people. I don't know why I did that - perhaps I wanted to hold onto a private moment, to keep it personal, as in a fully packed cell nothing is ever personal." Hazek wrote that the brown of the novel's jacket is not what he would've chosen, "but it's okay - I contemplated the cover for a while. I was captured by the gaze of the woman coming at me from 2,000 years ago, perhaps because in prison we are totally deprived of women and what concerns them, deprived of their voices, pictures, and perfumes. Nothing here is from the feminine world except the hair-removal cream with its pink cover that some of the detainees use instead of the razors that are banned because of their blades." The moment when he held his first novel was bittersweet. It had been five years since the release of Hazek's first collection of poetry. Then, suddenly, in the course of just a few months, "I received my novel, wrote a second one, and agreed to write the third: This is life, which never stops playing beautiful tricks." A month after Hazek got a copy of his novel, PEN International took up his case, demanding his immediate and unconditional release. The next month, the Alexandria library made its own public statement, officially firing Hazek. This set off a fresh string of protests from artists and authors, including Alaa al-Aswany, Hamdy al-Gazzar, and Bahaa Taher. A delegation of writers, artists, and lawyers went to the Attorney General's office to file an appeal. According Hazek's sister, nothing has yet come of the meeting. Many believe this case is important not just because of the controversial anti-protest law, which abrogates Egyptians' right to free assembly, but because it paves the way for future attacks on writers. Hazek's case has been linked to that of Karam Saber, who was accused of contempt of religion for his short-story collection Where is God? and given a five-year prison sentence in absentia. Egyptian novelist Hamdy al-Gazzar, in an email exchange, said that he thinks Hazek's "is a case of freedom of speech and expression". The case is particularly important, he said, as it reflects "how the new political regime deals and will deal with these cases and with the intellectuals, writers, and artists". Hazek, meanwhile, does all he can: He continues to write.